The biggest threat to property on a bluff or slope is not gradual erosion but a sudden landslide or collapse—most likely in a storm or during a wet winter.  For this reason, homes are no longer built right along the edge of a bluff or at the foot of a bluff or steep slope. 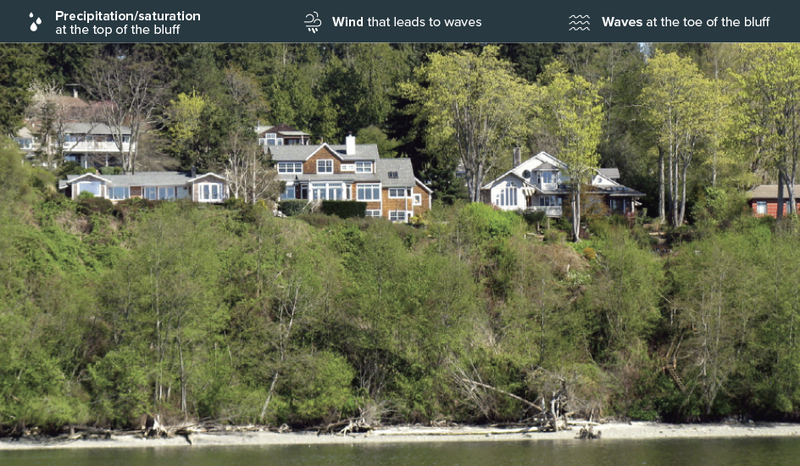 Homeowners have a variety of options for reducing erosion risk on bluffs without resorting to erecting expensive bulkheads—which harm the shoreline ecosystem and can even worsen erosion. 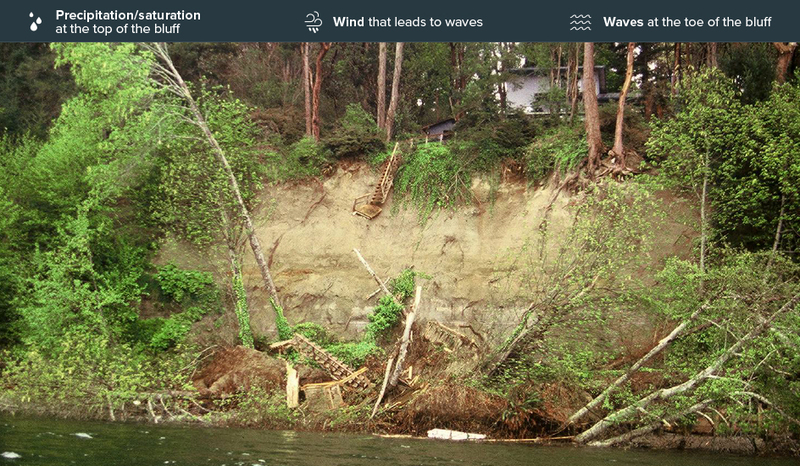 The rate of erosion on your bluff depends on a number of factors, including its height and its composition, which can include silt, fine and coarse gravel, and boulders. The amount and type of vegetation is also significant—because plant roots help hold the soil together and foliage helps protect the surface from rainfall. Groundwater movement and drainage patterns can also contribute to erosion. Waves that reach the foot of the bluff will cause erosion from below. Hard armor refers to any erosion-control structure on the waterfront, including a concrete or wooden bulkhead, rock seawall, retaining wall, or revetment. Over the years, many homeowners have built bulkheads and other hard armor to hold back eroding material from bluffs. 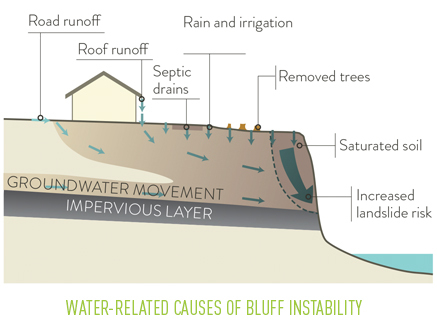 These cannot always prevent landslides, however, because erosion also happens higher up—due to the geologic character of the bluff or poor drainage or development practices. The hard armor also locks up sediment that is essential for replenishing nearby beaches. You can reduce erosion risk on your property by following proven management practices—such as ensuring that rainwater and roof runoff are diverted away from the bluff, leaving trees and vegetation intact, and adding native plantings. 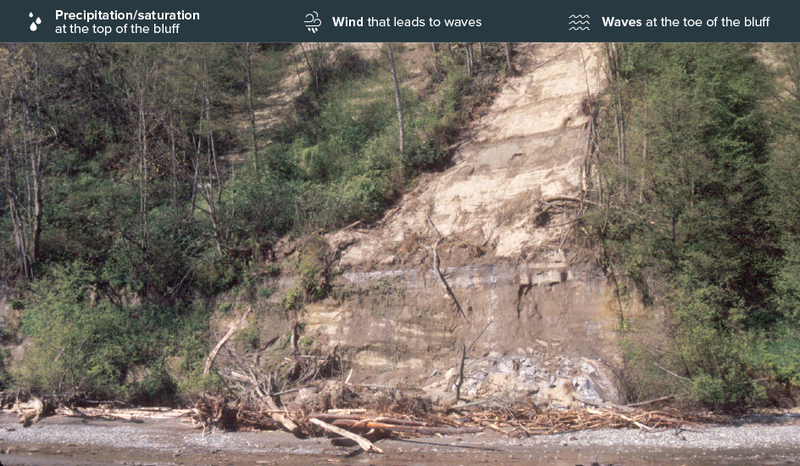 If wave-based erosion at the toe of the bluff is increasing erosion, be sure to consider soft shore protection options—which can offer good erosion protection—instead of a bulkhead. Stairs to the beach can aggravate bluff erosion, especially if every homeowner along a stretch of bluff has a separate staircase. Consider sharing waterfront access with one or more of your neighbors, and work with a coastal professional to identify a route that will minimize disturbance to vegetation. Most stairways do not need an accompanying bulkhead at the landing. Some of the newer designs have a hinged section at the bottom of the stairway, which can be folded up during the winter months or during storms. Also, trails to the beach are less likely to aggravate erosion if they meander rather than go straight. A qualified coastal professional can evaluate erosion risk on your property by identifying drainage patterns, the composition of the bluff material, evidence of past landslides, and more. If bluffs and beaches are allowed to erode naturally, their sand and sediment will help build up beaches as sea levels rise. But if bulkhead construction increases, more of those materials will be locked up.